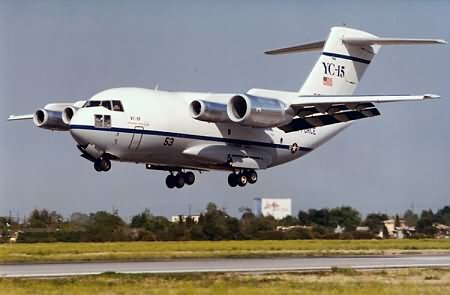 The McDonnell Douglas YC-15 was a prototype developed of the USAF ‘s AMST program in 1972. The competition was the Boeing YC-14. McDonnell Douglas developed the YC-15 from the Breguet 941s, using extensive wind tunnel testing (for optimum configuration testing) and using Cornell Aeronautical Labs B-26B In-Flight Simulator (for flight control testing). The aircraft itself is 124.25 feet long, wingspan is 110.36ft, height is 43.30. Max gross weight is 216,680lbs. The interior cargo-box is 47 x 11.8 x 11.4. Thrust for the YC-15 was provided by the JT8D turbofan (also the DC-9 powerplant) and produced a total thrust of 16,000lbs. The engines were mounted on shallow pylons mounted ahead of the wings leading edge. Thrust reversal was accomplished using so-called “daisy nozzles.” During final approach, with flaps fully extended and facing the engine, the engines provided 54% of the YC-15 lift. The straight wings consisted of ailerons, double-slotted flaps, leading edge high lift devices (Kruger flaps, etc), and spoilers. The trailing edge devices, flaps and ailerons spanned 75% of the wings trailing edge. The flaps could extend as much as 46 degrees into the downstream. The YC-15 was the first jet powered aircraft to use externally blown flaps (EBF). Flight controls consisted of the conventional hydraulic system and a stability and control augmentation system (SCAS). The SCAS was dual channel and 3 axis enabling hands off flight for high angle approaches (tactical approaches) and modes for attitude, altitude and heading. 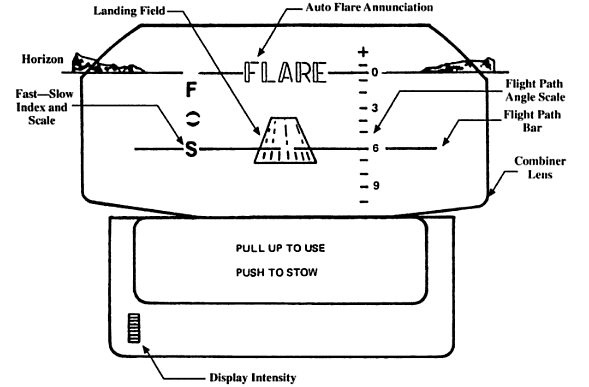 The YC-15 saw the first use of a heads up display (HUD) system, specifically called the VAM (Visual Approach Monitor). Developed by Sundstrand, the VAM displayed the horizon, flight path scale, airspeed indexer and touchdown point. 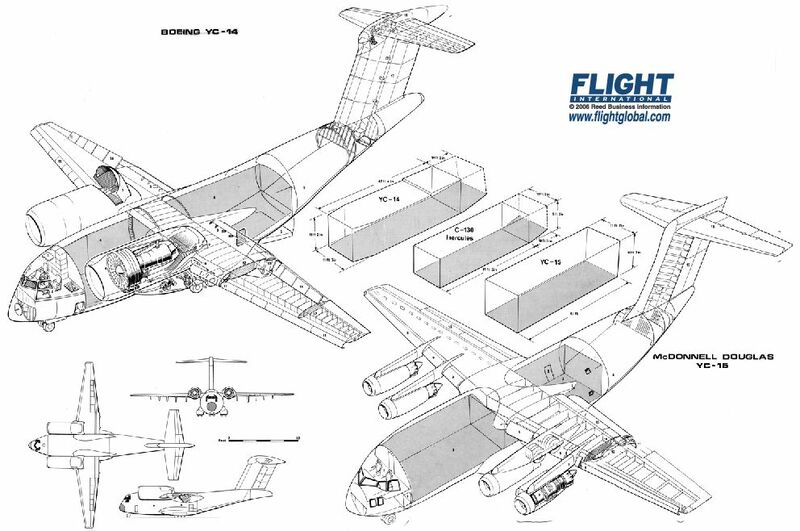 Being essentially a research airplane, the YC-15 did not need to fully conform to MILSPECS. As such it borrowed components from various aircraft, the DC-10 cockpit enclosure, the F-15 fuel pumps, the C-141 stabilizing struts, the A-10 UARRSI, the C-5 cargo handling equipment and other parts from 9 other types of airplanes. Cockpit instrumentation used components from 10 different airplanes. Part 2 will detail the YC-15s flight test program. Part 3 will detail the YC-15 technological contributions to the C-17. Cross-posted at Bring The Heat, Bring The Stupid. Can really see the C-17’s profile in the side view. Does the C-17 take advantage of the blown flaps? It certainly does and there are quite a few other things that McDonnel Douglas learned from the AMST/YC-15 program. I’ll be detailing that in part 3. Great post Mav! I love it when you talk airplanes. The JT8D engine was not only the DC-9 power plant, it was also the power plant for the 727, and was a civvie version of the J52-P8B, the heart of the A-6 Intruder. Trivia! aircraft or a YC-14 flew low approach and departed, time has faded memory. With EDW not far away, saw unusual aircraft from time to time.